It’s time folks, the splendid iPad Air is getting an older beefier sibling. It’s everything you loved about the iPads of yore, just bigger and badder. Meet the iPad Pro. 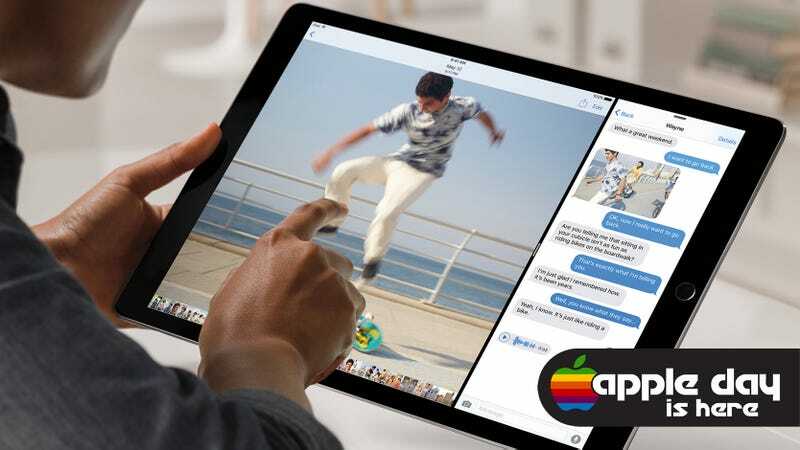 The iPad Pro has a 12.9-inch retina display, which is considerably larger than the 9.7-incher on the iPad Air 2. This is a big screen, which puts it more in laptop territory than a traditional tablet. As Phil Schiller pointed out today, you can use a full-size software keyboard on it. Or as Schiller suggested, play a keyboard. Synth jam on the iPad, woo woo! That display looks positively gorgeous: Its 2732 x 2048 pixels, which adds up to 5.9 million pixels. That’s more pixels than the 15-inch MacBook Pro with Retina Display. The design is really slight, despite the big screen: 6.9 mm thick, compared to 6.1 on the iPad Air 2. It’s not the lightest gadget you’ll own though, weighing 1.54 pounds. Under the hood, the iPad Pro is running a new A9x processor, which is apparently 1.8 times faster than its predecessor the A8X. According to Schiller this tablet is 80 percent faster than other portable PCs. Worry not, you’ll be able to take tablet photos with the iPad Pro. Yes you can! There’s an 8 megapixel rear-facing camera, and an HD FaceTime camera. The new design leaves space for a four speaker design. The audio of the speakers automatically changes depending on how you hold the device. According to Apple, the iPad Pro will get 10 hours of battery life on a full charge. Of course, the new iPad will run the new iOS 9 when it drops. It’ll be able to take advantage of some the operating system’s nifty new features like split screen mode. Unlike the Surface Pro, the jumbo pad doesn’t run a full OS. Which may or may not matter to yiuyou. For the much larger design, Apple’s introducing two new accessories: Smart Keyboard and Apple Pencil. The Smart Keyboard works much like the Surface keyboard in that it serves as both a cover and a keyboard. As with older iPad covers this one rolls up to serve as a stand. As for the pencil, it’s a stylus. An Apple Stylus! Jeez, I never thought I’d say the day. It looks like a nice aluminum little wand, but there is plenty of competition out there so it’ll have to be really convincing to beat out some very good stuff that’s already out there from the likes of Wacom and others. So how much is this super-powered iPad gonna cost? $800 for the 32GB wifi version, $950 for the 128GB wifi version, and $1079 with 128GB, wifi and cellular. The Smart Keyboard costs $170. The Pencil will cost $100. All of these products will be available in November. This is all exciting stuff! We’ll know for sure if iPad Pro is worth the hype when it drops.